Image Size: 25 X 19 in. 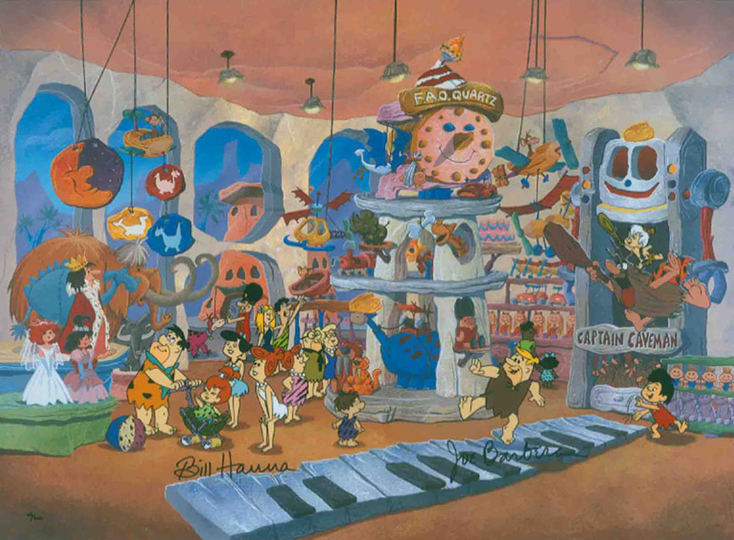 It’s the world’s greatest toy store – Bedrock style! For this colorful Limited Edition cel, designer Iwao Takamoto has taken the Flintstones and the Rubbles and dropped them into a faithful stone age re-creation of the F.A.O. Schwarz New York City Flagship Store. Signed by the creators of the Flintstones, William Hanna and Joseph Barbera. F.A.O. Quartz even has a musical theme through the courtesy of Barney’s two feet.